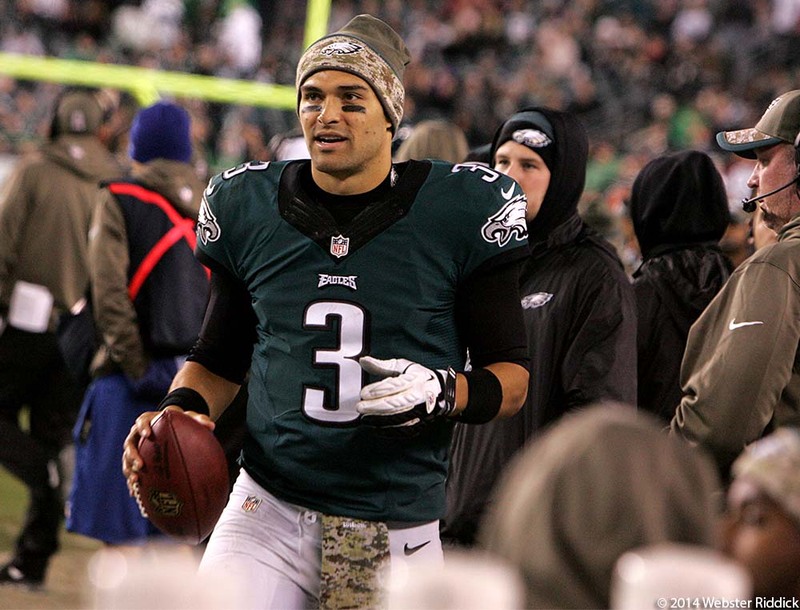 Happy days appear to be here again for Eagles quarterback Mark Sanchez. He came up big against the Carolina Panthers Monday night. His next assignment will be at Lambeau Field in Green Bay. Photo by Webster Riddick. 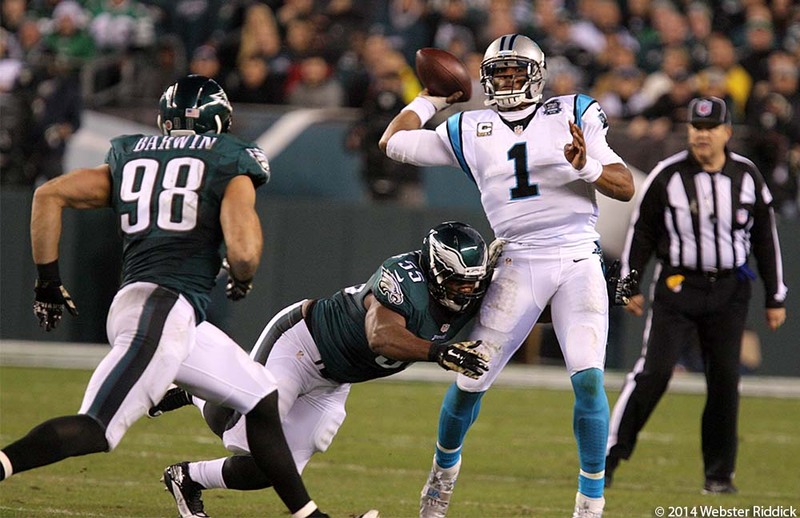 PHILADELPHIA— The competitive portion of Monday Night’s Eagles-Panthers game ended shortly before halftime mainly because Carolina was overmatched, undermanned and had absolutely nothing for the Birds. The Eagles were able to cruise to an easy 45-14 win over the Panthers because they scored in all three phases of the game—offense, defense and special teams-despite having just 37 yards rushing as a team. To be honest, the Birds could have beaten Carolina with one hand tied behind their backs. Defensively, the Eagles front-seven teed off on Carolina quarterback Cam Newton, sacking him nine times and forcing four turnovers—three interceptions and two fumbles. Connor Barwin had three and a half sacks by himself. The Birds defense cut off Newton’s running lanes and put pressure on him throughout the game. Connor Barwin (98) and Brandon Graham converge on Carolina quarterback Cam Newton. The Eagles had nine sacks. Photo by Webster Riddick. On offense, Mark Sanchez not only managed the offense well, he made some plays in the passing game and basically picked the Carolina defense apart. He completed 20-of-371 passes for 330 yards and two touchdown passes. After some tough times with the New York Jets, Sanchez looked like a guy who was having funs running the Eagles uptempo offense. Fun was something he didn’t have too much of during his days with the Jets. The win over the Panthers was his Sanchez’s start in two years. His favorite target was rookie wide receiver Jordan Matthews, who had a pretty good game, catching seven passes for 138 yards and two touchdowns. The six-foot-three Matthews is getting better with every game. “I think it’s definitely slowing down,” Matthews said. “I think early on you look at the game in a sense that I gotta hurry up and do something good. I gotta go out and make a play. Meanwhile, Head coach Chip Kelly was not happy with the small numbers the Eagles produced in the running game. Running back LeSean McCoy had just 19 yards on 12 carries. “We didn’t execute the way we needed to execute in the run game,” Kelly said. Darren Sproles had another electrifying performance with a 65-yard punt return and an eight-yard run for a touchdown that gave the Eagles a 17-7 lead after the first quarter. It was the ninth return touchdown of the year for the Birds special teams and defense. By the end of the second quarter, it was a wrap. Sanchez hit rookie wide receiver Jordan Matthews for a 13-yard touchdown pass and cornerback Bradley Fletcher scored on a 34-yard interception return for a touchdown. Next week, the Eagles will face one of their biggest tests of the season when they head out to the Midwest to take on a Green Bay Packers squad that destroyed the Chicago Bears in a 55-14 romp at Lambeau Field. On Sunday night, Packers quarterback Aaron Rogers carved up the Bears defense for 315 yards and six touchdown passes. The former Cal star can not only chuck it from the pocket, but he can also do it on the run. Something not lost on the Eagles defense. “You know what you get when you play the Packers. You know you got an explosive offense that can put up points at any time,” said Eagles free safety Malcolm Jenkins. “Rogers is really the only duel threat quarterback that really excels at both scrambling and he’s one of the real good pocket passers in the league. You have to pick your poison.